We’ve all been there before. An attempt to quickly send an email, or google the weather for today unexpectedly turns into an hour-long expedition on the information superhighway. An innocent search for something useful and needed (“how to cut onions without tears”) quickly turns into a desperate search to for the most meaningless bit of information (“What’s the guy who played Carlton on ‘Fresh Prince of Bel Air’ doing now?”). Apparently, the consequence of having all of the world’s information at our fingertips (most of it, anyway) is living in a state of permanent distraction. This is increasingly true when the things we want to do (watch movies, listen to music, read the latest celebrity news…) live on the same device as the things we NEED to do (finish homework, create presentations for work, write blog posts…). The same laptop we use for our frequently unpleasant but very necessary productive work is the same device we use for our fun but unproductive (and sometimes harmful) entertainment. The temptation to leave the thing we need to do for the thing we want to do is ever-present in us. Software developers provide apps that attempt us to let us have our cake and eat it too. In the midst of doing what we need to do, apps such as Tweetbot and UberSocial tell us the latest news about the things we like. For many of us, these attempts at multi-tasking simply lead to diminished results. If you’re using a machine that can do anything, it’s natural to want to do everything – particularly our favorite things. This makes it increasingly difficult to get any one “thing” done. “Finally brothers, whatever is true, whatever is noble, whatever is right, whatever is pure, whatever is admirable – if anything is excellent and praiseworthy – think about such things”. “Since, then, you have been raised with Christ, set your hearts on things above, where Christ is seated at the right hand of God. Set your minds on things above, not on earthly things”. But how can I keep my mind on things above when the same computer I’m using to use to finish my report can also easily satisfy my desire to know if Kim and Kanye are expecting baby #2? With such a high potential for distraction, it’s easy to see how Christians can use technology to foster a mind focused on the earthly and not heavenly things. At the very least, it’s a constant challenge. The secular and the sacred sit together, side-by-side, on the same device. Along with this challenge however, technology offers a useful tool in identifying areas of where we need to grow as Christians. These devices in some way, act as a giant Rorschach test. If we can now go anywhere (via the Internet), and look at anything, what do we choose to look at? Where would you go? What do you choose to set your mind on? The answer to these questions for each of us already exists. Just look in your browser’s history. Not unlike a personal journal, the Internet history in our browsers keeps a running log of the things we choose to keep our minds. 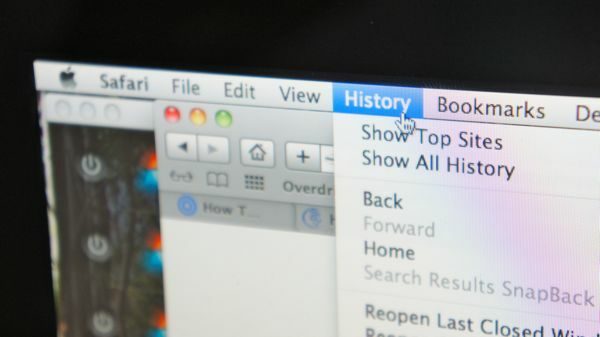 While a day’s worth of browsing might not show you everything, reviewing you browsing history over weeks and months (Apple’s Safari browser goes back two months) will undoubtedly yield a pattern from which we can learn a great deal. Mixed in amongst the task-oriented searches (looking up recipes, finding the right shoes for the kids), you will find many site visits of choice. Websites you chose to visit. Things you chose to set your mind on. And upon further investigation, you will likely see patterns emerge. What do those things in your history say about the type of things you want to keep in your mind? How are those things viewed in God’s eyes? Try to think back to what was going on when you visited those sites. Why did you choose to go there? Was it during a stressful time? Were you just bored? What did you do after you went to those sites? This information can be a useful tool for the Christian who is working to rid their mind of the things of this world and focus more on the things of God. It can also be a tool for identifying false gods we’ve allowed to creep into our lives. This exercise is even more telling if we review the browsing history on our smartphones, because for many of us, this is increasingly our primary portal into the online world. After completing this exercise, we may choose to (or choose not to) make conclusions about ourselves and the things we value based on our online activities. One thing, however, is certain. The social media sites, search engines, retailers, companies, and government agencies who are feverishly collecting data about what we do both online and offline ARE making conclusions about us based on this data. Did you give this exercise a try? Did you learn anything new?